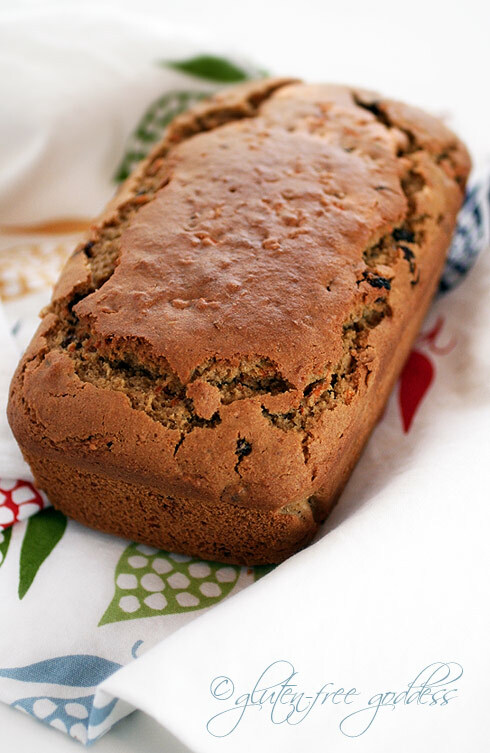 I've got a lovely tender tea bread recipe for you- a gluten-free carrot bread fragrant with chai spices and studded with juicy sweet raisins. 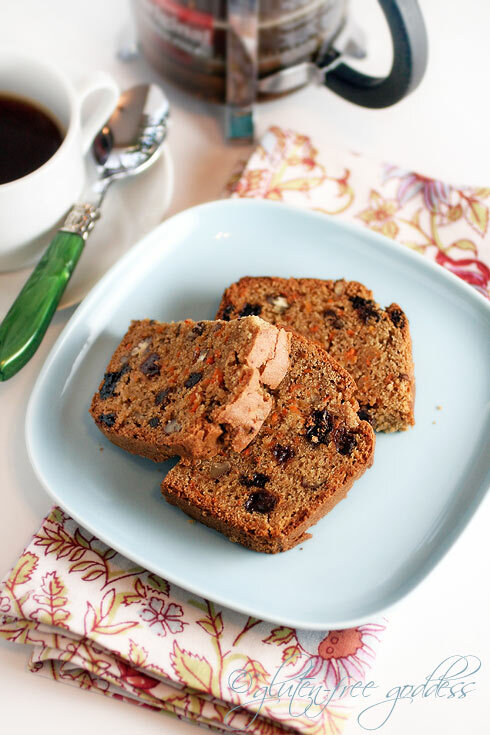 Ever since I baked those happy, sunny carrot muffins I've been pondering carrot bread. 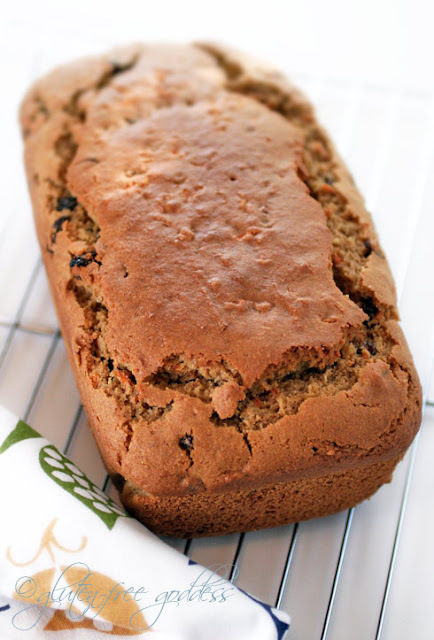 I wanted to create a new gluten-free bread recipe that featured several whole grains, including (gasp!) brown rice flour. Shocking, I know. Long time readers will confirm I'm not the biggest fan of rice flours. I almost never bake with them. And yet. There I was. Standing in the Whole Foods check out line. Buying a bag of Bob's Red Mill organic brown rice flour. On impulse. Because it just sounded good to me. Wholesome. Nutty. And friendly to carrots. Which is important in a gluten-free recipe. The friendliness. You want all your ingredients to get along. You want your flavors co-mingling in savory-sweet bliss. Supporting one another's strengths. Forgiving each other's weaknesses. No single gluten-free flour is perfect on its own, as you well know. Going solo doesn't work. It needs a supporting cast. It needs to find balance and achieve harmony via relationships. Give and take. That's what it's all about in the crazy game of gluten-free baking. Preheat the oven to 350ºF. Line a 9-inch ceramic loaf pan with a piece of parchment paper that extends up over the top of the two long sides (this makes it easy to grip and lift the loaf out of the pan). Whisk the dry ingredients in a large mixing bowl- flours through spices. Add in the eggs or egg replacer, oil, and half cup coconut milk. As you beat the liquid ingredients into the dry mix, keep an eye on the batter. It should be smooth and slightly thick, close to a muffin batter. If it is too stiff or dry, add in more coconut milk as needed, a spoonful at a time to achieve a creamy-thick batter. I ended up using 3/4 cup total coconut milk, but you may need less liquid if you live in a more humid climate. Stir in the grated carrots, raisins and nuts by hand and mix to distribute. Scoop the batter into the parchment lined ceramic bread loaf pan and smooth out the top with a silicone spatula. Bake in the center of a pre-heated oven for one hour. (If you use a thinner metallic pan, you may have to adjust baking time as it may cook faster- especially around the edges.) The loaf should feel firm to the touch, and a wooden pick inserted into the center of the loaf should emerge clean. Remove the pan from the oven and set it on a wire rack to cool. When the loaf has settled and is cool enough to handle, use a thin knife to loosen the two ends from the pan, and carefully lift it out of the pan using the parchment paper on either side of the loaf. Note- the loaf is fragile while warm, so don't try to slice it right away. When cool, slice the carrot bread with a sharp bread knife. Serve with your favorite vegan buttery spread, or whipped cream cheese. Use medium weight gluten-free flours to sub medium weight flours like sorghum (jowar) flour, and brown rice flour. Coconut flour is it's own kinda animal, but I'd guess almond flour might work if you don't care for coconut flour. Sub tapioca starch with other starches, such as cornstarch, potato starch or arrowroot starch. In place of raisins you might try dried cranberries. Leave the nuts out if you prefer. Wrap leftover slices in foil, bag and freeze to preserve "just baked" texture. For more tips see my Gluten-Free Baking Tips post and my Baking Substitutions Help page.